I went out for lunch yesterday with Chris Young from the Real Bread Campaign to discuss the order of the day for Uprising, the RBC conference in September. 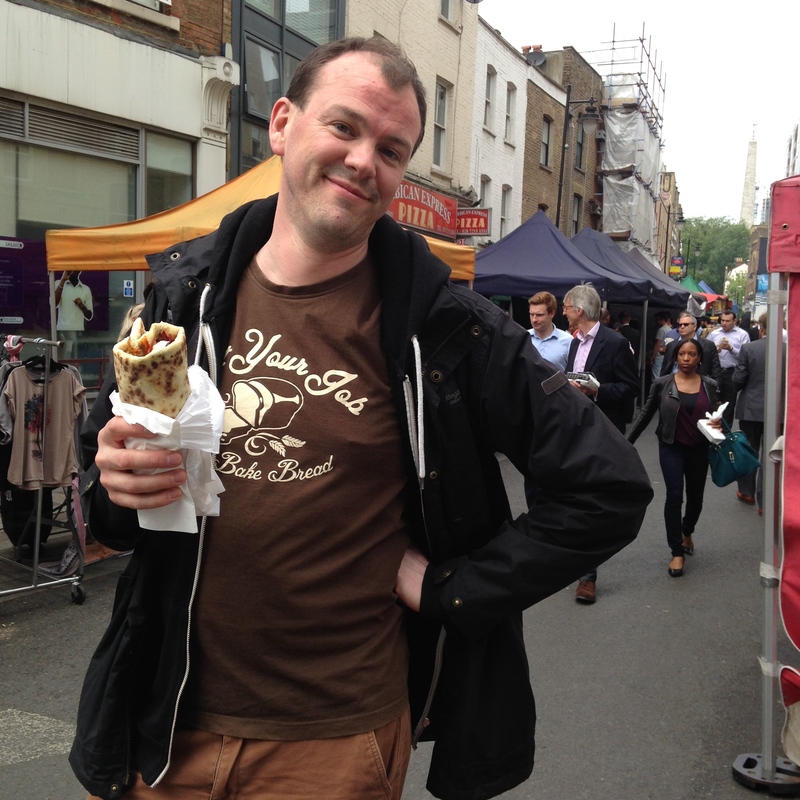 We wandered past various restaurants and ended up at the food market in Whitecross Street which has a great range of fabulous food (to eat there, rather than ingredients to take home). After a bit of voyeuristic walking up and down we settled (naturally) on the one in which there were two lovely ladies rolling out dough....It sells gozleme. 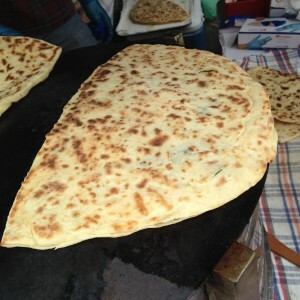 According to Wiki, gozleme is a, "savoury traditional Turkish flatbread, made of hand-rolled dough that is lightly brushed with butter and eggs, filled with various toppings, sealed, and cooked over a griddle." That sums it up exactly. The two ladies rolled out dough into thin (maybe 2 mm) ovals, then they scattered a range of different foods over the top (cheese, egg, onions, sausage...), folded the dough over and pressed it flat. 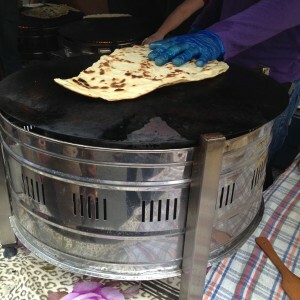 They then cooked the dough lightly on a griddle and stacked it up. 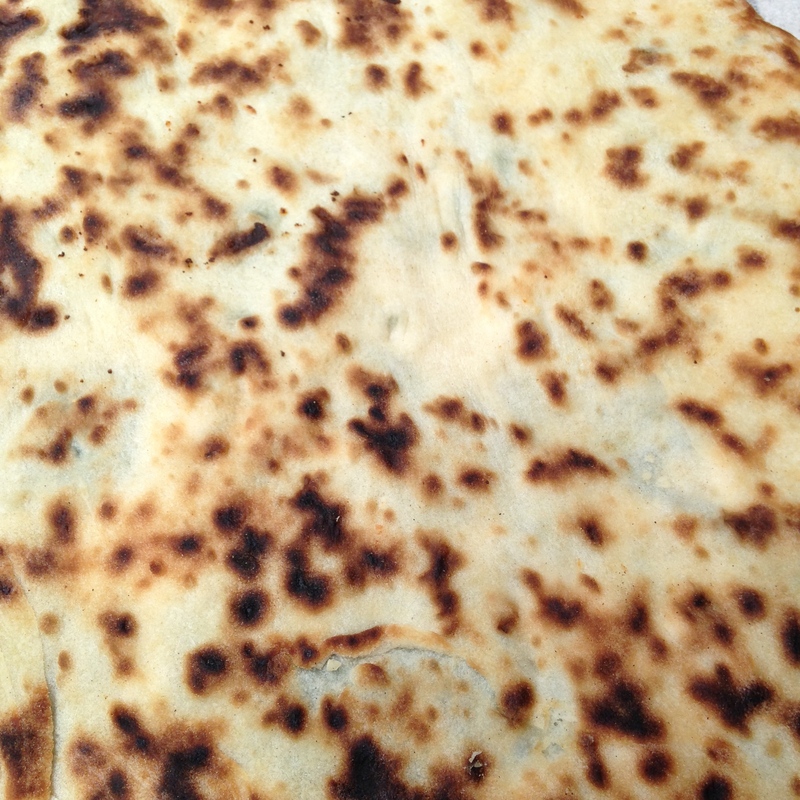 It does not require an oven which is great - fresh bread, no oven = no excuses!!! Make your bread and eat it too even if you - wait for it - don't have an oven! 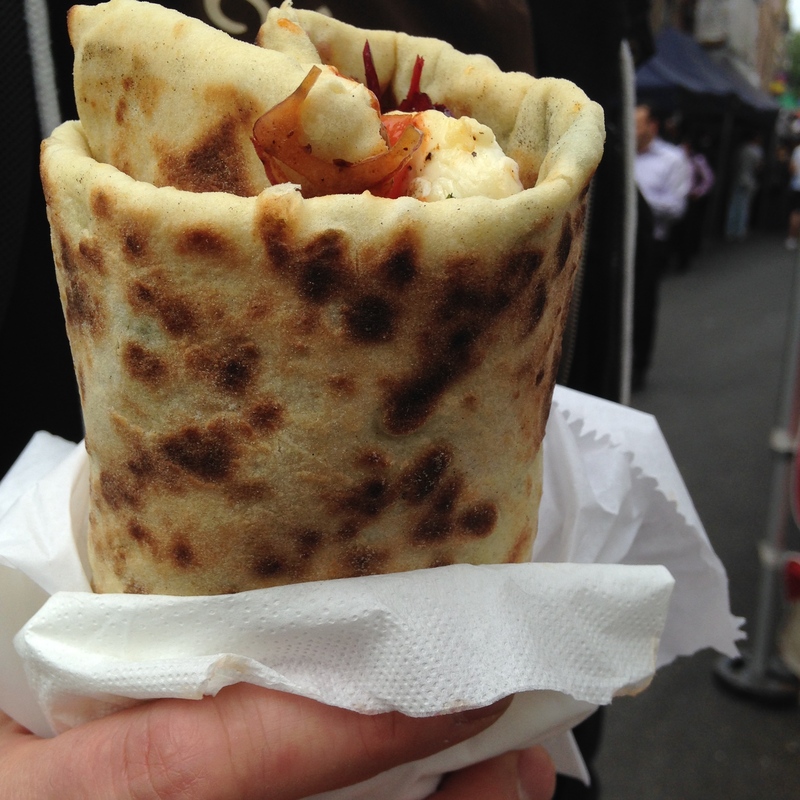 The people at the front of the food stall took your order, warmed up the bread and then put things like chiles, fermented cabbage, some kind of yummy sauce, herbs on it and then rolled it up, wrapped it, and gave it to you to eat. 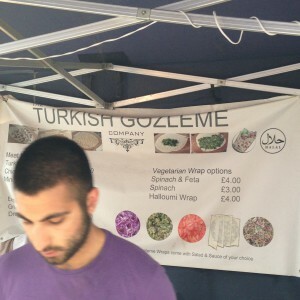 It was lush! 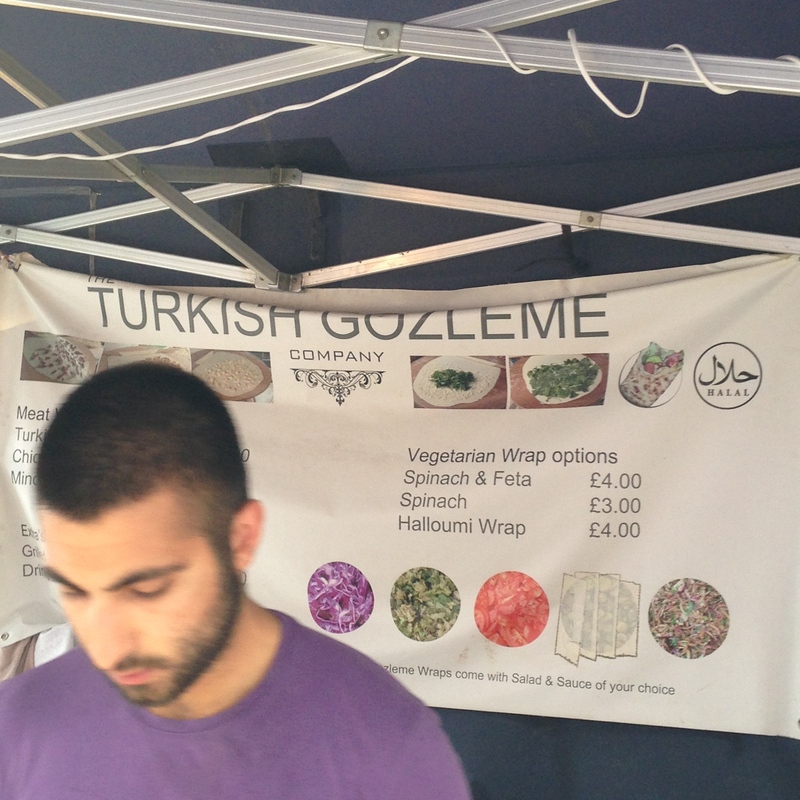 The stall is called Turkish Gozleme and it's near the bottom of the stalls in Whitecross Street. 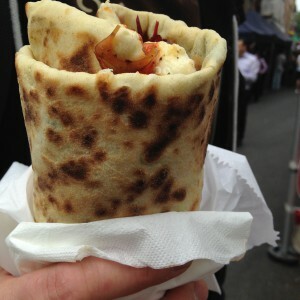 They also do one with grilled halloumi inside which sounds AMAZING. Click here to get information and book a ticket for the Real Bread Campaign's Uprising meeting in September. It promises to be informative and fun with plenty of bread chat, updates on progress made on the RBC's core goals and discussions on plans for the future. See you there!